There's something unique about the high-pitched whine of a fully electric race car, accelerating from 0 to 60 mph in four seconds, showing off insane amounts of torque instantly. "There's a lot of hype about electric vehicles taking over," says Matthew Flanagan, president of Purdue Electric Racing. "And after being involved with this car, I can say I totally believe it!" Every year, Purdue engineering students design and build their own single-person race cars, competing against other universities in events organized by the Society of Automotive Engineers (SAE). In 2013, Formula SAE created an Electric division, with cars powered exclusively by batteries. 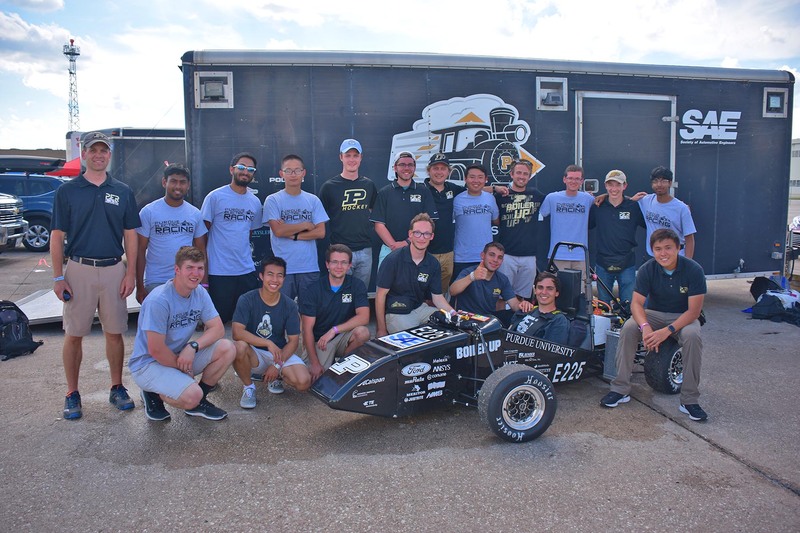 This year’s Purdue Electric Racing team successfully competed in two events, achieving their best finish ever. For electric cars, however, the battery is everything. Purdue has chosen a 300-volt lithium-ion battery module, which weighs 160 pounds -- more than a quarter of the car’s total weight. These heavy-duty batteries also introduce safety concerns unique to this form of racing. For example, everything must be waterproof to avoid short-circuiting; at competitions, cars sit in lawn sprinklers for 10 minutes to test this. And because of the volatile nature of lithium-ion batteries, everything must be cooled with fans or radiators. Dynamic events include acceleration, where the car’s straight-line speed is clocked; skidpad, where they put their turning radius to the test; and autocross, an individual time trial on a pre-arranged road course. Purdue achieved first place in both acceleration and skidpad, and second place in autocross. Finally, all cars compete in an endurance race, where they share the course and attempt to run 20 laps in as short a time as possible. Unfortunately, Purdue’s cooling system malfunctioned, forfeiting the endurance portion of the competition. However, their strong overall showing (3rd place) was the best ever for a Purdue Electric Racing team. Then came the big competition: Formula SAE Electric in Lincoln, Nebraska. More than 100 university teams, both electric and internal combustion, gathered on a giant concrete airfield to compete against the clock and each other. Once again, Purdue performed well in the preliminary events: 3rd in acceleration, 2nd in autocross, and 1st in skidpad. Students from other schools frequently visited Purdue’s trailer to discuss their designs; one even took a picture of the car for his computer’s wallpaper. However, the final endurance race stymied the team once again. After completing the first lap, the car suddenly stopped running. Because of the safety concerns unique to electric vehicles, course stewards were not allowed to touch the body of the car, and after two minutes of restart attempts, the team’s day was over. They finished 7th overall.